Q: Our old dog’s health is starting to fail, and I fear we may have to say goodbye soon. How do I help my children cope? A: For many children, the loss of a pet is their first experience with death. As parents and caregivers, we may instinctually try to hide our own emotions to shield them from pain. But seeing adults grieve helps children learn healthy coping mechanisms. Crying and feeling sad are normal responses to death, and kids shouldn’t be ashamed of them. Whenever possible, give children a choice about how to say goodbye. Recently, a father brought a dog hit by the car to the hospital, where the pet was pronounced dead. The mother and son, about eight, arrived a while later, and we brought the child into a separate room to explain what had happened and to ask what he wanted to do: Would he like to stay outside or to see his pet and say goodbye? He wanted to say goodbye. At first, the boy stayed in the doorway, looking at his dog covered in a blanket. He and his parents started to tear up, and I invited the boy over to hug his dog, if he felt like it. He came over, gave his pet a big hug, let out a huge sigh, and stepped away. He was teary, but OK. Most kids are resilient and will be able to move on. But some children may act out, which could mean they are having an especially hard time. It’s never a bad idea to let your child’s support network—teacher, school counselor, and perhaps pediatrician—know about the loss. 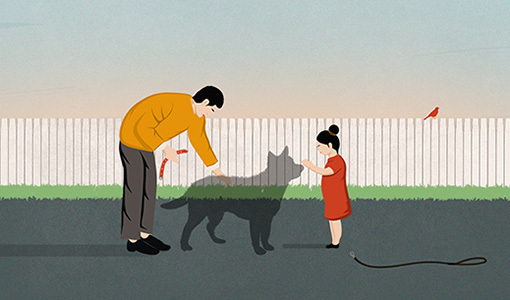 Children on the autism spectrum, in particular, often share a very special bond with their pets and may have a more dramatic emotional response. I recommend that families work together to memorialize their pet in some way, which can include doing something special with its collar, planting a tree in its memory, or creating a photo scrapbook. The Rainbow Bridge website offers an excellent workbook, where children can describe their pet, draw a picture, and explore feelings common to grief, including fear, loneliness, and anger. When it comes to getting a new pet, I tend to lean toward advising families to wait “a while,” a time frame that is different for everyone. You want to allow the whole family time to grieve, of course. But this is also to avoid the pitfall of getting a new pet too quickly, which invites comparing its different personality unfavorably to its predecessor. Eric Richman, veterinary social worker at Cummings Veterinary Medical Center, responds to a question about children and pet loss. Please email questions to genevieve.rajewski@tufts.edu. For any pet health issue, owners should contact their veterinarian.